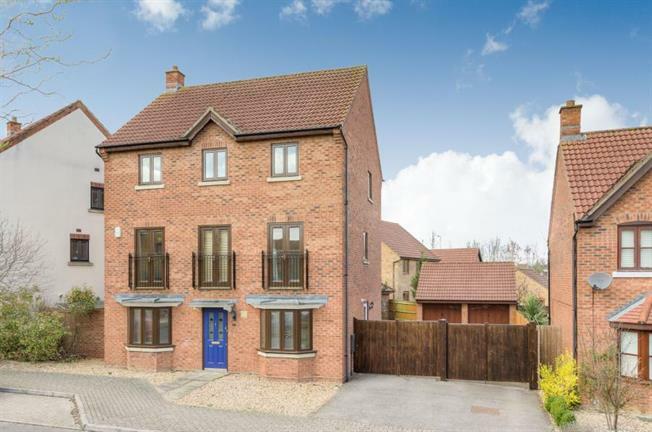 4 Bedroom Detached House For Sale in Milton Keynes for Guide Price £550,000. Located in the ever popular area of Westcroft and within catchment of great schools, is this well presented four bedroom detached home. The property is being sold with NO UPPER CHAIN and is perfectly located to the local district centre with large supermarket and array of shops, food outlets and public house. When entering this nearly 2000 square feet double fronted home you are greeted to a bright entrance hall with doors to the study and dining room that could also be used as second reception room/snug. The open plan kitchen/breakfast room shines with natural light from the large bay window and perfect for entertaining with doors leading to the garden. The ground floor is completed with utility room and cloakroom. On the first floor you will find a lovely dual aspect lounge with French doors opening to a Juliet balcony. This room could easily be used as another bedroom if required. A further double bedroom, single bedroom and bathroom are also on this floor. The second floor you will find two excellently sized bedrooms both with dressing areas and en-suites. Outside the property benefits from gated access to a driveway and double garage with open plan access to the garden. Viewing is highly recommended to appreciate the size, space and finish this fantastic family home has to offer. The property in brief comprises: Entrance Hall, Cloakroom, Dining Room, Study, Kitchen/Breakfast, Utility, Lounge, Four Bedrooms, Two En-Suites and Double Garage.